"Here we go again," I thought, as the Canadian Broadcasting Corporation (CBC) cameraman knocked on the door. It was the last day of April and the first day of an open season on black bears in selected parts of central and northern Ontario. Deadly force was again being unleashed against innocent wildlife in the name of votes and cash, at the expense of basic facts. Ontario once had two bear hunting seasons: in the spring from Apr. 15, when starving and befuddled bears usually start to emerge from hibernation, to June 15 in some regions, June 30 in others, and again in the fall, from Sep. 1 to the end of November, when bears are starting to enter hibernation. In January 1999 it was ended, when then-Minister of Natural Resources, John Snobelen, said, "The government made the decision to move to end the spring bear hunt because it will not tolerate cubs being orphaned by hunters mistakenly shooting mother bears in the spring." Females were not legal game but had, like males, used up fat reserves during hibernation, especially so if they had given birth and nurtured young - a huge metabolic drain that leaves them ravenous, having lost up to 40 percent of their weight. The hunters take advantage of the bears' hunger by providing piles of irresistible food, ironically like the garbage that attracts bears into the proximity of humans. Before nearing bait, mother bears send cubs into hiding. "I know what you mean," said the cameraman. It turned out that he was the one who had photographed a spring hunt back in 1998, for a segment that I had also been on, that appeared on the news. A hunter shot what he thought was a huge bear. "We all ran up to it," the cameraman recalled, "and really, it wasn't much bigger than a labrador retriever." The news show caught it all. Last year, the Minister of Natural Resources and Forestry, without bothering to consult with the bear biologists we taxpayers paid for within his own Ministry, or academics who also study bears, instituted a spring hunt in five regions across northern Ontario (limited, however, to Ontario residents). The real money in the original spring hunt came from American, and some European, hunters with a desire to kill bears and none of their own to kill. Many Ontario hunters have no desire to shoot hungry bears starving for food and attracted by garbage, and look down at the practice with disdain. 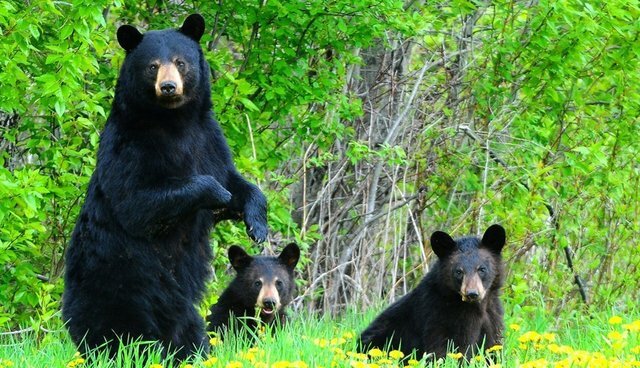 There have been seven recorded fatal black bear attacks in Ontario in 133 years, with none in a residential area. Contrary to myth, mother bears with cubs have never killed anyone. And yet, spring hunt proponents claimed that killing maybe 300 bears (about 200 were acknowledged to have been killed in last year's spring bear hunt, with an "estimated" additional 100 "not reported") will somehow reduce whatever risk the remaining 100,000 (no one is sure of the exact numbers) might pose. When the spring hunt was stopped in 1999, the fall hunt was expanded, with no significant decline in the number of bears killed. The Ministry's own research, including the most recent paper published by the International Association for Bear Research and Management (of which I am a member), clearly shows that the spring hunt made no difference in the level of risk bears pose to humans. But, facts don't matter where misconception is concerned. My own frustration at politicians making absurd claims is shared by academics, such as Joe Hamr, co-ordinator of Cambrian College's Environmental Monitoring and Impact Assessment program. On a recent radio show, he listened to the current Minister of Natural Resources and Forestry (formerly Ministry of Natural Resources) and then was asked his opinion. You can hear it here. One can never say never to the possibility of a dangerous bear encounter, however small the risk - but shooting bears in the spring does nothing to reduce that risk. Politicians know that fear motivates decisions at the polls, and by posing themselves as being concerned about "public health and safety," the government can garner votes without spending the money, however modest, required to assure real health and safety by restoring adequate funding of its Bear Wise program. In Elliot Lake, Ontario, the year prior to the introduction of bear-resistance garbage containers in conjunction with public education - key components of the Bear Wise program - there were some 500 "nuisance" bears, with three shot. But, in 2004, with the program solidly in place, there were 87 nuisance bears with none shot. Actual research shows that complaints and conflicts with bears can increase when there is hunting, and even last year's hunt saw a possible increase in complaints. Scientifically, there is no way to tell much of anything in a two-year program, since the most significant driver of bear behavior is availability of natural food, and that varies from year to year. This year and last, a delay in the arrival of warm spring weather has held up development of plants and other food by about two weeks. Next year, it may be two weeks ahead. Experts using sophisticated methodologies in estimating bear numbers see no increase in the bear population, but the people who don't do that are claiming the numbers have increased. Not so, but facts don't count, and politicians know that perception is everything. What is increasing, of course, is people, and encroachment in the bears' ancestral habitat, and reports as a result of encouragement by hunters (not all; just the minority who want to kill bears in the fall and spring). The Ministry estimated that about 274 cubs were orphaned each year in the original spring hunt, most of whom would die of hunger, exposure, or predation. No Minister is going to win votes by saying that he doesn't care, or that the profits to be made trump compassion for cute bear cubs dying because of his policies. And so, the myth is promoted that it's all a matter of public health and safety. The current Minister inherited this two-year test hunt when he took office from a predecessor not known for his astuteness. The new guy may be brighter. He recently made a reasoned decision in defiance of hunters by reducing the "harvest" of moose from populations experiencing serious declines, shortening hunting seasons and reducing the number of "tags" (essentially permits) issued by 15 percent. The hunters, of course, wanted him to allow them to keep killing moose as before, but also to go after bears and wolves, citing four scientific papers to back up their position. The only problem is, the papers said no such thing. Now, if only the Minister will listen to his own biologists and be truthful when he says the concern is human health and safety, this spring's Ontario bear hunt will be the last.